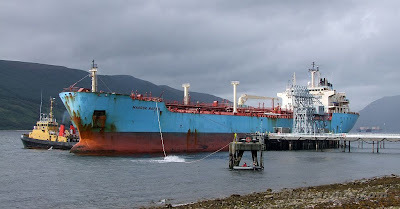 Seen berthing at Loch Striven fuel jetty, newly vacated by ORANGELEAF, the Maersk products tanker MAERSK RAPIER was arriving to load fuel. The presence of some of her fleetmates in the form of the four containerships laid up a little further up the loch caused some specualtion that she, too, was to join them. In fact, MAERSK RAPIER sailed two days later to Garelochhead.